A man has been arrested on suspicion of the “attempted theft” of the Magna Carta at Salisbury Cathedral, according to Wiltshire Police. The incident was first reported yesterday evening (25 October), but police have since announced it as a suspected attempt at theft, rather than vandalism. Photographs suggest that the glass case was hit with a hammer-like object in the upper left corner, making a small hole, but without breaking the rest of the toughened glass. A cathedral statement says that it is “undamaged”. Witnesses described the man involved and a 45-year-old matching his description was arrested on suspicion of attempted theft, possession of an offensive weapon and criminal damage. He was taken for questioning at Melksham police station, 40km north of Salisbury. Police are now appealing to witnesses to come forward. There are four surviving original copies of the Magna Carta (Great Charter), dating from 1215 (another is at Lincoln cathedral and two are at the British Library). The Salisbury version is the finest of the four. The document is regarded as the cornerstone of English liberty, law and democracy. 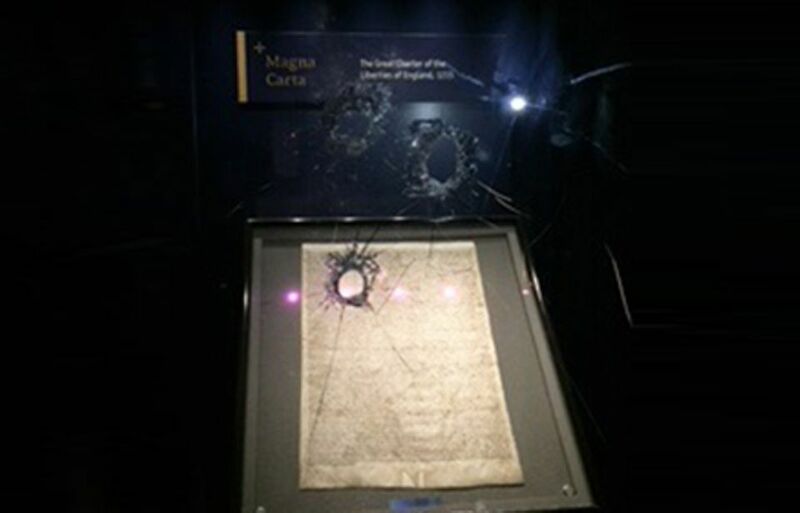 The Magna Carta exhibition will remain closed until further notice, although a cathedral statement says that they “aim to reopen as soon as possible”. This incident will cause further damage to Salisbury’s tourist business, following the novichok poisonings earlier this year.